The first day of school. A new year. It's always a little thrilling and nerve-wracking. Even in the years when we need more summer, when we don't feel quite ready to come back, the first day is exciting. New possibilities. New students. One of my favorite things about teaching is the brand new start we get each year. It doesn't matter what happened the year before, it may have been the worst year ever, but the new year is just that - new - and I can start over and change whatever I want to change. I love it. I've learned the importance of a good start. 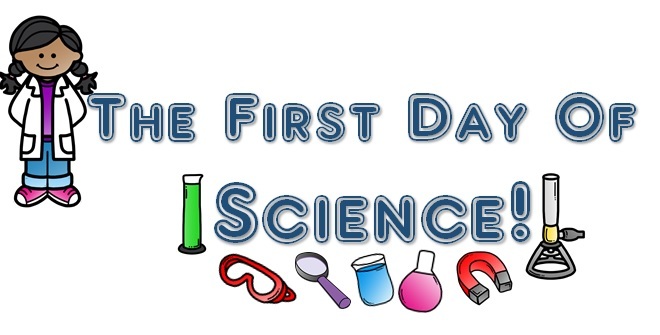 The first day is my chance to get the kids excited about science and looking forward to coming to class. It truly sets the tone for the entire year, and I only get one chance to do it right. Trial and error over the years has given me a pretty good set of activities and events to start the year. Organize my room for the the start of year. Make sure everything is clean, thank maintenance for all they did over the summer. Arrange desks. I like to start the year with desks in a U shape. This makes for easy conversation. When I want students to work in groups of 4, I just pull two chairs around to the other side and have four kids working at one table. There is enough room. I have students clear the tables of everything except the lab supplies. They can put their books on a now empty table or in the seat pockets on their chairs. Hang posters. I have begun making my own posters. I can't find what I want pre-made, so I create my own at Vistaprint. It's super easy and when you hit a sale (there is almost always a sale) it's no more expensive than purchasing posters from a teacher supply store. 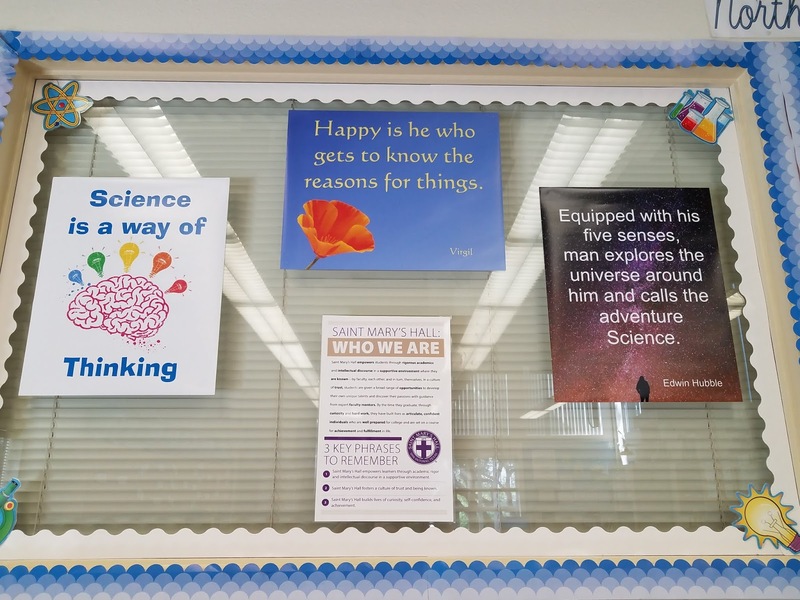 I have limited wall space, and only one true bulletin board. 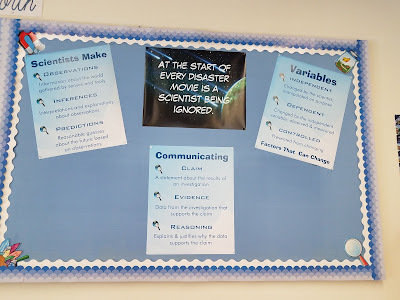 I hang teaching stuff (anchor charts, word walls) on my cabinets as well. Create seating charts. I seat students alphabetically until I learn their names. 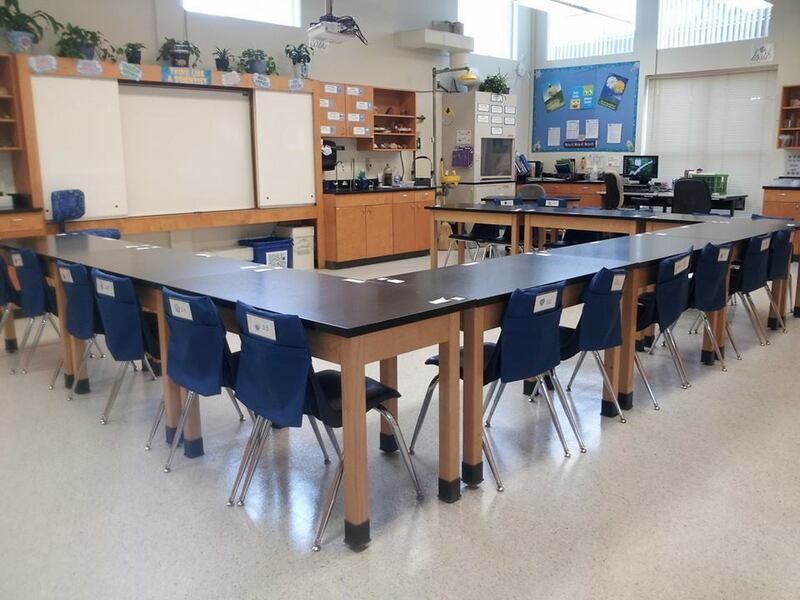 I do not let students choose their own seats until later in the year, after they know the expectations and procedures of our classroom. I write students names on a piece of paper or index card and tape it to the desks. 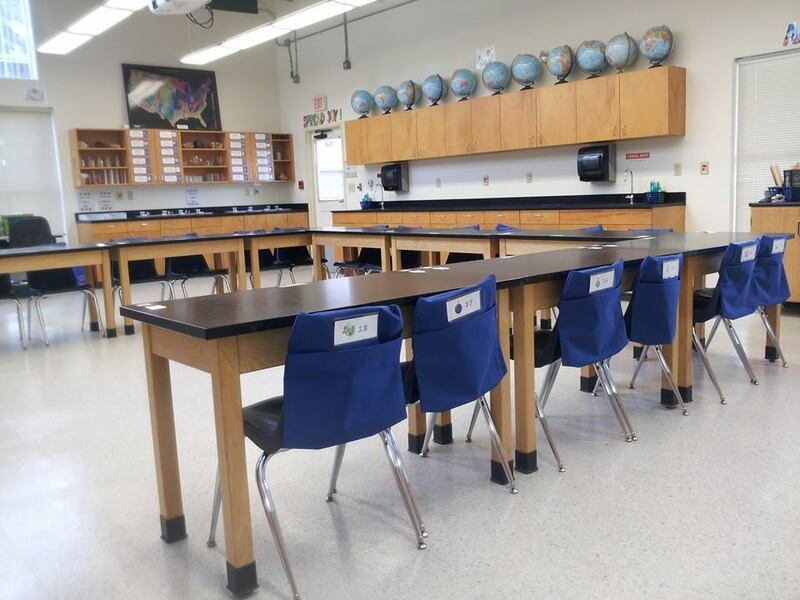 When students enter the first day, they are directed to find their seat. Create the agenda PowerPoint. I begin every day with our agenda shown on the board. This tells the students what the need to do to get ready for class. Greet students at the door, asking them to check the board as they enter the room. After students are in the room, double check schedules to make sure everyone is in the right place. Introduce myself and welcome the kids again. 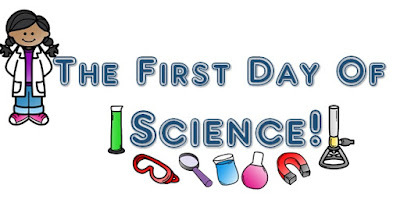 Explain to the students that they have just learned the first procedure for science class - how to enter the room and get ready for class. I explain that every day there will be an agenda displayed for them. They don't have to guess about what's going to happen, just look at the board. We provide a "lab manual" for students. I hand those out and help students put them in their science binders. 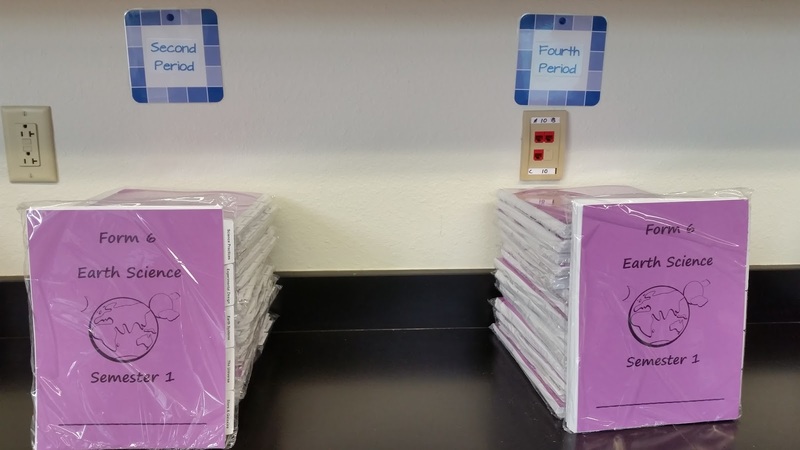 All students are required to have a binder for science. Take a few minutes to look through the binder and see what we are going to study this semester. I then point out the "Important to Know" section of the binder. This is where I have our rules, policies, and procedures. I do NOT spend time going over these. That is a sure way to bore kids out of their minds and turn them off to science. It bores me too. I point them out and tell the kids that I will introduce policies and procedures as we need them. I do ask them to know the rules, but I don't make a big deal of it. I point out the Safety Contract and ask them to have it signed and returned. I do a quick lab. 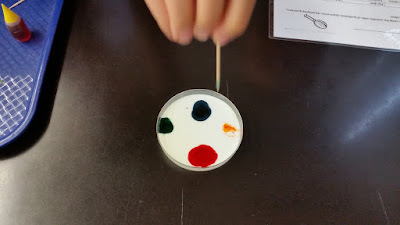 I use the drops of food color in whole milk lab, but any quick, fun lab will work. It just needs to be a lab with a bit of "wow" to it. This lab serves several purposes. It's fun. I want kids to enjoy their first day with me. It sets the tone for the class - we do investigations in my room. It gives me a chance to teach several procedures - getting materials, cleaning up materials, working with a partner. Here is a more detailed explanation of the lab. I wrap up with a review of procedures, give them a chance to ask a few questions, tell them how glad I am that they are in my class, and send them on to their next adventure middle school! 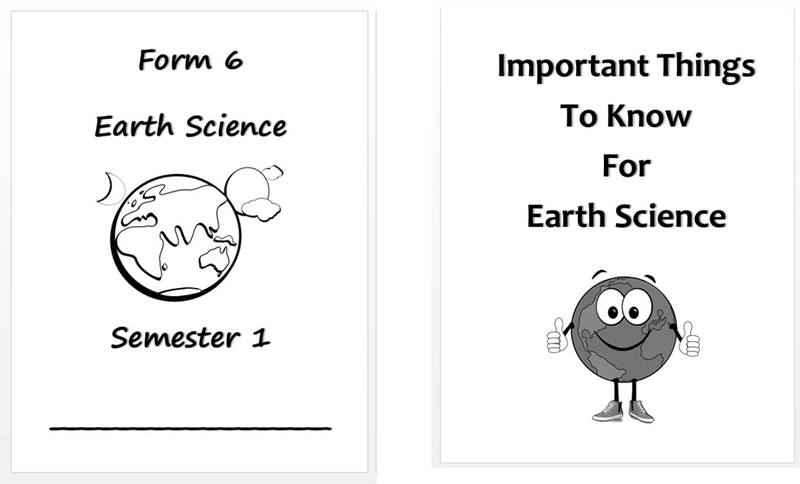 All of the handouts I use on the first day of school can be found here. Read on to see how I spend my first week in middle school science.